Ok so I am obsessing over Alex Chu at the moment. This would not have happened if I had not seen his cooking show. Anyway.. since yesterday I have been watching the videos of not only him but as well as the other members of Clazziquai. But I was happy to see this video!! So happy..
It’s the live performance of Hajji and TJ (하찌와TJ) with Alex for the song 남쪽 끝섬 (Namjjok KKeutseom/Southern Island). I love love love love love this song to the nth level since I heard it on We Got Married. I want to hear it again and again even though I’ve heard it a number of times before. If you’ve watched the show you will most likely remember Alex singing the part “ppoppohago shipseo (I want to kiss you)” to Shinae. Waa I miss watching the first season of WGM! Anyway.. I changed the way I romanized the name of the band. I used to romanized it like Hachi, but the hangeul character is not the equivalent of ch. If you are interested in the lyrics, you can visit my old post for the song.. Southern Island. I kinda miss this song! and it was a treat to see Alex sing it! watch it before it gets removed! It feels nice to be blogging again! So I know you’re reading too much words on this post.. thus I will share a video of the unplugged version of Romeo and Juliet from Clazziquai… I liked them first before I did Super Junior (kk sorry boys). Blame it on watching Kim Sam Soon~~~ ever since I heard She Is and Be My Love.. I became a fan.. I just loved the way Alex and Horan’s voices blend together.. and DJ Clazzi’s songs are really good! 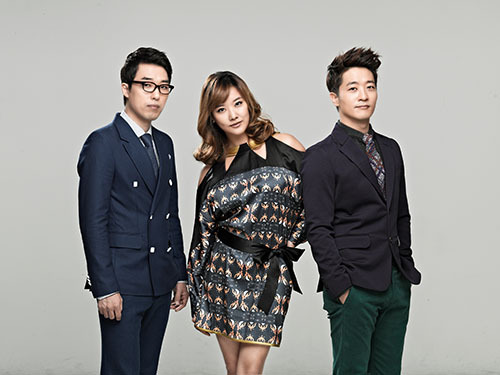 To those who are not familiar with them.. you might recognize Alex who was in We Got Married for quite sometime. He was paired off with Shin Ae, who was single at that time… The song that I am posting was the song they sang in ep.8 of the first season (if I am not mistaken). This was the song Alex and Shin Ae tried to sing together (before Alex sang Hwabun/Flowerpot). I’m sure you have seen the LGT We Live in Oz commercial (if you haven’t then make sure you watch it especially if you are a Kibum and Kim Bum fan!). The first time I saw the CF, the song really sounded so familiar, especially the one who sang the song. And it is indeed very familiar as it was Horan’s voice! The song from the LGT CF is called Wizard of Oz and is their come back single. This was released June 4, but the MV that I am posting was posted on youtube yesterday. The MV is I think from their Beat in Love song… I think they just reused it.. ehehehe.. but this MV is really interesting. I love the song most especially because I miss Alex and Horan’s voices. I couldn’t find the translation yet but I will be updating this entry once I find it. Found the translation 😀 Enjoy the song!